David Stradling, Richard Stradling. Where the River Burned: Carl Stokes and the Struggle to Save Cleveland. Cornell Universirty Press, 2015. In the 1960s, Cleveland suffered through racial violence, spiking crime rates, and a shrinking tax base, as the city lost jobs and population. Rats infested an expanding and decaying ghetto, Lake Erie appeared to be dying, and dangerous air pollution hung over the city. Such was the urban crisis in the “Mistake on the Lake.” When the Cuyahoga River caught fire in the summer of 1969, the city was at its nadir, polluted and impoverished, struggling to set a new course. The burning river became the emblem of all that was wrong with the urban environment in Cleveland and in all of industrial America.Carl Stokes, the first African American mayor of a major U.S. city, had come into office in Cleveland a year earlier with energy and ideas. He surrounded himself with a talented staff, and his administration set new policies to combat pollution, improve housing, provide recreational opportunities, and spark downtown development. 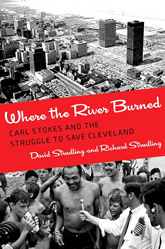 In Where the River Burned, David Stradling and Richard Stradling describe Cleveland’s nascent transition from polluted industrial city to viable service city during the Stokes administration.The story culminates with the first Earth Day in 1970, when broad citizen engagement marked a new commitment to the creation of a cleaner, more healthful and appealing city. Although concerned primarily with addressing poverty and inequality, Stokes understood that the transition from industrial city to service city required massive investments in the urban landscape. Stokes adopted ecological thinking that emphasized the connectedness of social and environmental problems and the need for regional solutions. He served two terms as mayor, but during his four years in office Cleveland’s progress fell well short of his administration’s goals. Although he was acutely aware of the persistent racial and political boundaries that held back his city, Stokes was in many ways ahead of his time in his vision for Cleveland and a more livable urban America.